I am looking for a home for my exceptionally affectionate, loving and soulful kitty boy. He talks to himself and is unique in every way. Blossom was found June 25, 2018, after having hitched a ride on a truck from Peru, Illinois. 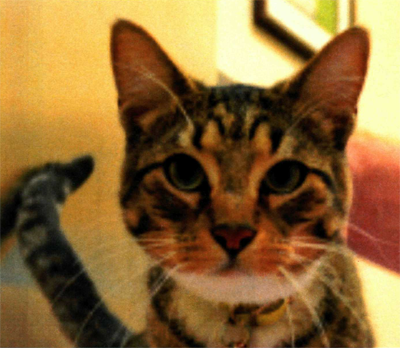 He is a gentle, people-loving, one year old male, in need of a new home with people who cherish their cats. He is chipped, up to date on vaccinations, neutered, and well cared for by Autumn Green Animal Hospital in Geneva. He is front-paw declawed. If you have space in your home and heart for this adorable young man, please contact me at 630-406-8485, and leave a voicemail message.